Hospitality Management is not a very popular major to study in Florida with only 1,828 graduations each year. Depending on your school aid, your Hospitality Management degree could cost anywhere around $57,577 to $321,066 in Florida. Starting salaries of $34,752 and mid-career salaries of $62,430 are typical for a Hospitality Management graduate. See the top Hospitality Management degree programs inside Florida. 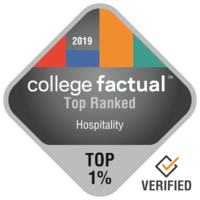 Keep scrolling to see the top universities and colleges in Florida for Hospitality Management students. Some of the factors included in the ranking methodology are graduate salaries, loan default rates, accreditation, and more. Florida International University is a great option for students pursuing a Hospitality Management degree. In addition to its bachelor's programs, Florida International University offers graduate degrees in Hospitality. This school is one of the largest schools in Florida. Considering that 7.0% of borrowers have defaulted, FIU's default rate of 5.8% is really good. You'll be able to learn about numerous ethnicities thanks to FIU's diverse population. Videos from FIU could be a great way to get more info on the university. Any student pursuing a degree in Hospitality Management needs to check out University of Central Florida. In addition to its bachelor's programs, University of Central Florida offers graduate degrees in Hospitality. The specific location of Orlando, Florida, is decent for learners who prefer a quiet, suburban area. You may want to commit to an ACT prep course before you take the test because the typical ACT score is 26. For graduates who want to carry on after earning a bachelor's degree, University of Central Florida has graduate programs available. Take a virtual tour for more information on UCF's campus. Florida State University is a good choice for students pursuing a Hospitality Management degree. Florida State University hospitality management majors make 15.0% more than the average hospitality student. Want a sizable student body? This school has over 20,000 students on campus. This school's rate of student loan default of 4.8% is significantly below the national average of 7.0%. The student body at this school is highly diverse and includes undergraduates from across 48 states and territories and at least 48 countries. Get a better idea of what student life at Florida State is really like by seeing a few campus videos. It's hard to find a better school than Florida Atlantic University if you wish to study Hospitality Management. Prefer a sizable student body? This college has over 20,000 students on campus. 77.0% of freshmen return for their sophomore year. This school is thought to be a good option for those in the military. Ever wish you had a simple way to determine a school's grades in each subject? Now you do. Take a look at Florida Atlantic University's scorecard. Any student pursuing a degree in Hospitality Management needs to look into Saint Leo University. It is found in the suburban area of Saint Leo, Florida. You may want to commit to an ACT preparation class before taking the exam since the usual ACT score is 23. There is an advanced degree program accessible for students who are curious. Ever wish colleges were graded with a report card? Now they are. Visit Saint Leo University's scorecard. The University of West Florida is among your top options if you want to study Hospitality Management. The surrounding area of a major city is wonderful for scholars trying to find adequate possibilities for social networking, adventure, and discovery. The average scholarship amount granted to freshman students is $2,734 with 64.0% of freshman students getting some form of scholarship. Roughly 80.0% of applicants send ACT scores, with the standard score in the 24 range. Look at all of The University of West Florida's rankings to learn more. Bethune - Cookman University is among your top options if you want to study Hospitality Management. The surrounding area of a main city is wonderful for young people trying to find adequate options for social networking, excitement, and discovery. Bethune - Cookman University does not require first-year students to live on-campus. About 66.0% of the instructors at Bethune - Cookman University have full-time hours, which means they should have enough time to give attention to students in their class. View a few school videos for more information on what student life is like.